This is another shallow mount subwoofer that you would be happy to put in your truck or SUV. It has a mounting depth of just a little over 5 inches. Its enclosure is made of a thick, medium density fiberboard. It is protected by a rugged black carpeting that gives it a premium look, aside from making it slip and scratch resistant. The subwoofer itself is capable of handling up to 200 watts RMS. It is wired for 2-ohm impedance. It has quick release compression terminals; and backed by a one year warranty. The sealed, truck style enclosure houses the 10-inch prime subwoofer. It is designed to fit in tight spaces with its dimensions of 3.25 inches depth on the top and 5.25 inches on the bottom. This unit has a wedge design that is optimized for placement in single cab trucks that have very limited space. It fits in the rear seats and trunks of most cars, SUVs, and mini trucks. This subwoofer can handle 100 to 200 watts RMS, with 400 watts of peak power. It is capable of producing clear and clean bass. This speaker hits the bass drum clearly, with lower tones perceived with lots of clarity and power. It is also very efficient, not needing lots of power to get to respectable bass levels. aluminum has the ability to quickly dissipate heat as it acts like a heat-sink. This results to the subwoofer able to maintain low temperature, improving its durability in the process. This subwoofer is also protected by a stamped seal basket for added rigidity. It has stitched tinsel leads that are designed to reduce fatigue and minimize the chances of shorting by spreading stress and strain over a greater area. These parts all make the subwoofer durable and high performing. The power handling specs of this subwoofer conform to CEA-2031 industry standards. Simply put it, the sub can handle power under continuous demand. It isn’t unlike other subs that can handle instantaneous power handing that can damage voice coils over time. Q. How long is the warranty for this product? Q. What’s the recommended amp for this sub? A. It should work well with a mono amp with 200-300 watts RMS. 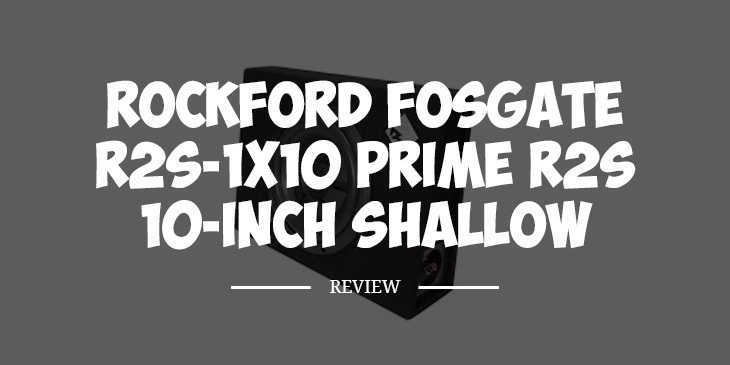 Rockford Fosgate has established a reputation as one of the brands with decent quality subs sold at reasonable prices. This sub is affordable and fits in most trucks and SUVs with limited space. It has a rugged black carpeting which gives it a scratch resistant and non-slip surface. It also looks like a premium speaker from afar. This subwoofer won’t shatter your windows though as it delivers decent bass levels at best. But that should be enough for you to hear and feel the low notes while you are driving. This is one of the top rated shallow mount subwoofers on Amazon.com, and something I can recommend to budget-conscious motorists.